A Victorian market hall could be sold or leased to a new operator, a council has announced. 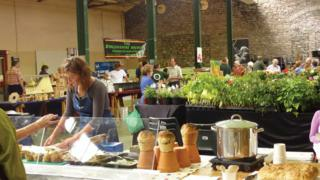 Brecon Market Hall has an arcade of shops open six days a week and hosts a twice-weekly market, plus other events. Powys cabinet member Phyl Davies said it was difficult for the council to invest in the premises in the current financial climate. He said the authority would be "keeping in touch" with existing market traders during the search for an operator. The hall, which dates back to 1840, hosts a monthly farmers' market and has been a key venue for Brecon Jazz Festival concerts since 1984. "The market hall is an important building in the centre of Brecon and its future use is of great importance to market traders and residents," Councillor Davies said. He confirmed the building could be leased or transferred to a new operator to give it "an exciting retail future". The deadline for expressions of interest is 30 April. A Powys council spokesman said it was part of the authority's ongoing review of property and assets, pointing to the refurbishment of Newtown Market Hall as an example of what could happen in Brecon. Nigel Evans, co-ordinator of the monthly farmers' market, said: "It's a magnificent building with lots of potential if someone is prepared to spend the money. "Markets generally are dying a death - we need to do as much as we can to keep it going."